As ski patrollers, we are subject to all kinds of weather. Cold, snow, rain, you name it. We ski in all conditions, for hours at a time, so it’s important to dress appropriately throughout the day. I was a fan and customer of Icebreaker before joining the pro deals team. 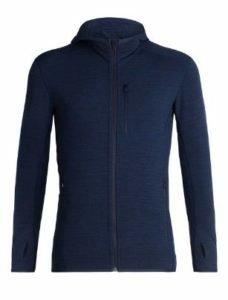 Prior to this season, I was already the proud owner of a pair of Icebreaker ski socks (super comfortable and they somehow don’t smell), the Merinoloft Hyperia hooded jacket (ribbed, lightweight and uber cool) and Victory long-sleeve zip (a mid-layer top). At the start of this winter, I added the Oasis long-sleeve crew top and Oasis leggings (the ultimate long johns). I’m a fan! We all know the importance of layering and Icebreaker has it figured out to a tee. Fortunately, or unfortunately, there are three seasons in addition to winter. Spring is beginning to take hold across the country, along with its wildly fluctuating temperatures. My mid-layers are becoming outer layers for spring and early summer. If you’re up for outdoor adventure after winter ends, Icebreaker’s merino wool feels cooler, wicks faster, and resists odor. My newest addition, and one of the latest and greatest from Icebreaker is the Descender long-sleeve zip. It’s been updated for 2019 and is now available on the Canadian Ski Patrol pro deal site (www.skipatrol.ca). It is a nice outer layer for spring weather but can also function as a mid-layer next winter. It features channeled fleece to provide warmth and temperature regulation. The brushed Merino fleece is softer and more breathable than synthetic fleece. There’s a reverse coil front zipper and zippered chest pocket with media cord port too. The Descender LS Zip is comfortable, warm and fits like a glove. As with all Icebreaker products, it is top quality, lightweight and made from Merino wool. Not only that, it’s made for spring and the warmer months ahead. Icebreaker breathes environmental and social responsibility from how its garments are designed and made – and they make great clothing. Icebreaker is an important partner of the Canadian Ski Patrol. You can create your own eligible CSP personal account at www.ca.icebreaker.com/pro.